We all need direction from time to time. 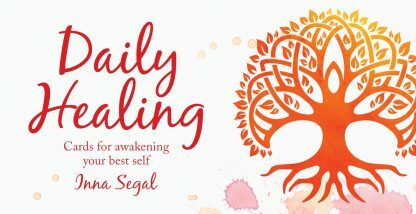 With insightful messages, Daily Healing Cards work as a reminder to delve into your heart and soul, to awaken the eternal wisdom that lies beneath your subconscious so you can be your best self. Just pick a card with a question close to your heart and trust in the guidance of this special little pocket deck to aid you on your path every day. Inna Segal is a gifted healer and a pioneer in the field of energy medicine and human consciousness. She can psychically �see� illness and blocks in a person�s body by intuitive means, explain what is occurring, and guide people through self-healing processes. Her work has been endorsed by many well-known authors, medical doctors, nurses, psychologists, and alternative health professionals. Inna has traveled throughout the US, Australia, Germany, France, Asia, Slovakia, the UK, and the Caribbean teaching her practical, life-changing techniques.